Buying a new car key can be a stressful situation that consumes a great deal of time and leaves us somewhat out of pocket. Most of us have no idea who we should be calling in the event of losing car keys or how much a replacement is likely to cost. 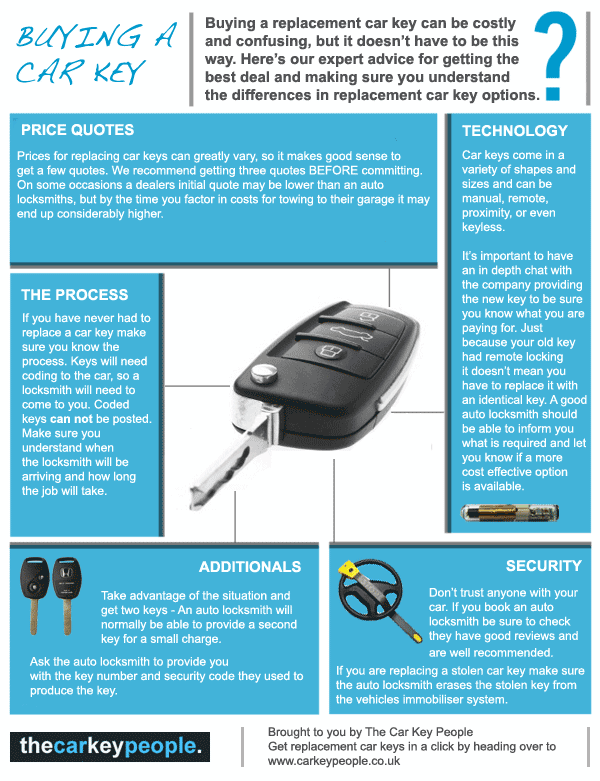 Our handy infographic provides a helpful resource explaining the best options available, and what we should expect from a good replacement car key service. In summary – the most important thing to remember when buying a replacement car key is to get a few quotes and to be sure the company you book are well recommended with good testimonials across a wide range of websites and forums. Business listing directories such as FreeIndex supply trusted reviews of car locksmiths and is a good starting point to find a trusted auto locksmith in your area. If you can think of any other good advice for buying a replacement car key let us know in the comments section below.